In a move that may shock some boxing fans, HBO, which has been the premium cable home for many of the sport's biggest events for the better part of the last five decades, announced that it will no longer be doing regular boxing broadcasts. A report by the New York Times states that HBO is leaving the boxing broadcast business after 45 years and more than 1,000 fights shown on the network. The report states declining ratings as a key factor in the network no longer carrying boxing as well as the lack of return on investments on the boxing programs compared to other programming who have generated far bigger rewards and ratings with a smaller budget. One such example is the documentary on WWF legend Andre The Giant, which drew about than seven million viewers. Gone are the days of boxing being an important component of the network as HBO had been slowly decreasing the amount of live boxing broadcasts per year. Its latest live boxing card, the September 8 card titled “SuperFly 3,” drew some of the lowest ratings in the history of the network when it came to live boxing. 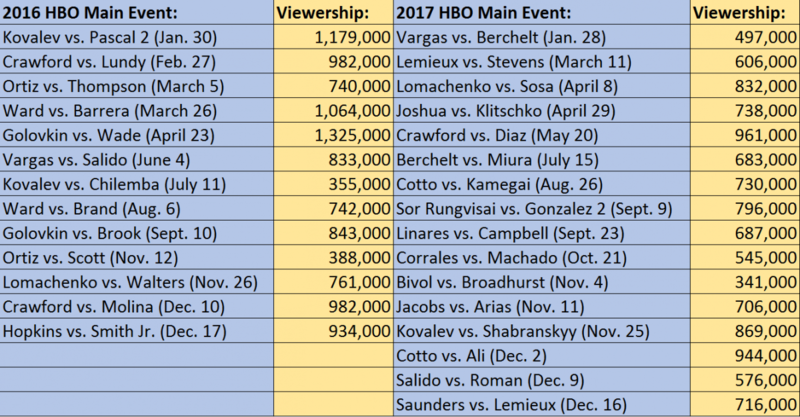 Now it should be noted that HBO is open to the idea of doing a select few fights if they are big enough for the network to try and get the broadcast rights to, but this essentially ends the company's run as a major boxing company. As previously mentioned, the move shocked some people in boxing, mainly those that are not in the know. Those that have been following television viewership trends or even pay somewhat close attention to how HBO has been operating in the last couple of years know that this was somewhat expected. Although those people may have expected something like this to happen, it doesn't make it any less painful as for many fans in the United States, HBO was the sole reason those people became fans in the first place. I even recall one particular broadcast in 1978 in which HBO aired a pro fight from New Jersey's Rahway State Prison between top light heavyweight contender Eddie Gregory and James Scott, who had spent most of his adult life in prison. It was a bizarre broadcast, but certainly one of the more memorable boxing events HBO had produced in the 1970s. So what happened with HBO? How could a titan of the sport for so long have fallen in a matter of a few years. First, let's look at viewership for the network. 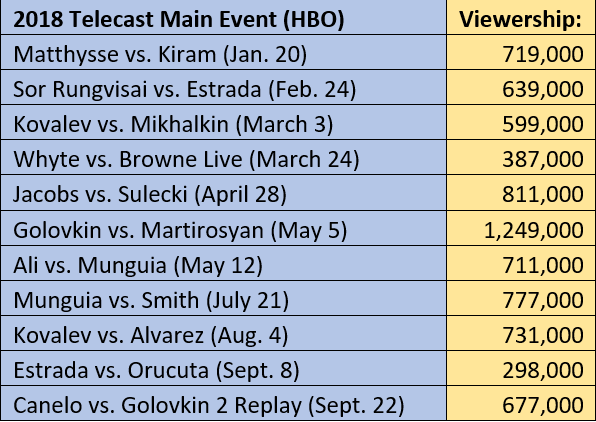 Excluding pay-per-view events, there has been a sharp and steady decline in viewership and attention being given to boxing events over the past few years. Of course, looking at this doesn't seem to show why the numbers have gone down. There are several theories as to why the viewership has gone down. The first one, and this might be the most probable, is simply that HBO has failed to adjust to the times. With the advent of online streaming taking over sports, HBO never really seemed to embrace it. They have the HBO GO app, but it was more catered towards on-demand programming rather than live streaming such as Showtime has been doing. There's also the fact that Top Rank Boxing left HBO in 2016 to eventually move over to ESPN and losing a roster that includes the likes of Vasiliy Lomachenko and Terence Crawford was a huge blow to HBO. In hindsight, Bob Arum was smart to leave HBO as he appeared to have been among the first to see the end of HBO coming. The network also suffered the loss of a few key individuals that made HBO the titan that it was. Floyd Mayweather going from HBO to Showtime was a huge deal and the fact that announcer Larry Merchant, who has been with HBO from 1978 to 2012, was no longer a part of a commentary team that truly felt special and unique. Although he wasn't well-liked by many, Merchant was one of the polarizing figures in the sport and his departure did directly lead to a less impactful commentary team that now mainly consists of Jim Lampley, Max Kellerman and Roy Jones Jr. (still a solid team, but not as good as previous iterations of HBO Boxing's commentary teams). If anything, the move may have been expected by some, but the timing sure feels somewhat odd. The announcement came two weeks after the company had a successful pay-per-view event headlined by the rematch between Canelo Alvarez and Gennady Golovkin, an event that saw at least a million buys. There's still one more big boxing card the network has remaining in its lineup and that is the October 27 world title doubleheader from Madison Square Garden. In the main event, Daniel Jacobs will fight Sergiy Derevyanchenko for the vacant IBF middleweight title while Alberto Machado defends his WBA “regular” super featherweight title. HBO shutting down its boxing division also means a number of prominent boxers will look for new television homes. Gennady Golovkin and Canelo Alvarez, who recently headlined the September 15 HBO pay-per-view from Las Vegas, are free agents, but now, other boxers such as Jacobs, WBA light heavyweight champion Dmitry Bivol, WBC super flyweight champion Srisaket Sor Rungvisai and former world champion Roman Gonzalez, among many more, will be looking for television homes for their next fights. Those boxers will now likely be getting offers from the likes of ESPN, Showtime and the DAZN streaming service. While it is sad to see many of these fighters no longer be competing on HBO, this does essentially start a new era for the sport. With HBO gone, Showtime (alongside FOX), ESPN and Matchroom Boxing are now competing for those boxers. A decade ago, HBO was the clear No. 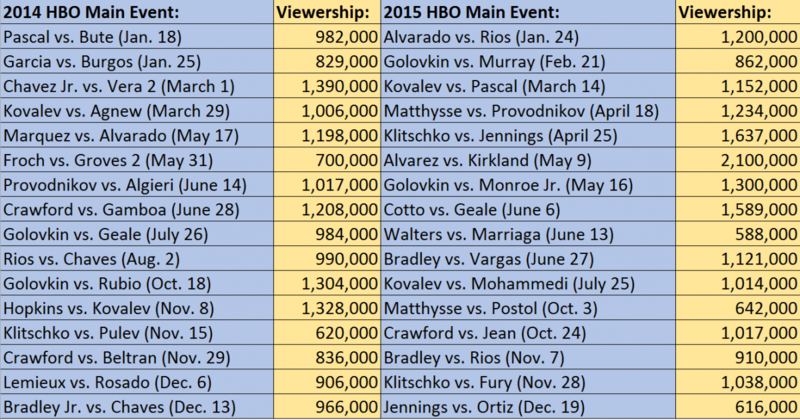 1 in terms of boxing broadcasts with Showtime a distant second. Now in 2018, with ESPN, FOX and the DAZN streaming service entering the fray, there are perhaps more options for people to watch the sport than ever before. We've already seen some signs of HBO fighters coming to other networks as ESPN is broadcasting the rematch between Sergey Kovalev and Eleider Alvarez for Alvarez's WBO light heavyweight title in early 2019. The network also got the rights to broadcast Miguel Berchelt's WBC super featherweight title defense against Miguel Roman in November on the ESPN+ streaming service. For fans of sports such as basketball and baseball, the free agency period after every season is always an exciting one because of the possibilities of multiple stars heading to other teams and completely shifting the power from one team to another. Right now, we are in a similar situation with all of these boxers suddenly looking for U.S. television homes to fight in. Of course, the two biggest "free agents" right now are Alvarez and Golovkin as their respective contracts expired after September 15. For Golovkin, since it is looking like he may only have a few years remaining on his career, he will most likely go to the highest-bidder for each of his fights moving forward. This creates multiple interesting scenarios, but the biggest takeaway for Golovkin, and for Alvarez to a larger extent, is that the other middleweight stars are either with Matchroom Boxing (Daniel Jacobs and Demetrius Andrade) or with PBC (Jermall Charlo). The options are there for either fighter to take the best deals out there, but since the WBC ordered Golovkin to fight Charlo in a final eliminator for the WBC title, there is always the possibility of that fight taking place in early 2019 on Showtime, or even on FOX. Beyond that, fights with Jacobs, Andrade, Billy Joe Saunders and Ryota Murata (who is with ESPN in the United States) are certainly likely for Golovkin. It's tough to say where Golovkin ends up next, but my personal belief is that, although the prospect of getting to fight only one eliminator before getting a third fight with Alvarez is certainly incredibly appealing, Golovkin will likely go another route for his career in 2019. As such, I can see Golovkin fighting Murata for the WBA "regular" middleweight title in spring 2019. A Golovkin vs. Murata fight, potentially at the Tokyo Dome, would be one of the biggest boxing events in the history of Japanese boxing since Golovkin is now a global star of the sport and Murata is certainly the biggest domestic star in Japan. Now, if that fight were to happen, there are a number of different ways this can go. One scenario is to have Golovkin fight Murata in Japan and have the fight be on ESPN+ as a prime time fight in Japan would be the early morning in the United States. You could work around this and have the fight be shown in primetime in the United States on the main ESPN television channel, but that would mean the fight would have to take place potentially around 11 p.m. ET, which would be noon the next day in Tokyo. ESPN could also simply demand the fight to only be shown on primetime ESPN and that it would be much easier for all parties for the fight to be shown in the United States. That would somewhat diminish the allure of the fight, which was supposed to be a massive Japanese event that could have been the first boxing card to take place at the world-famous Tokyo Dome since Douglas' upset win over Tyson in 1990. As for Alvarez, his next fight is expected to be the December 15 Madison Square Garden show against David Lemieux. It's not a guarantee the fight will happen as Alvarez has yet to even meet with Golden Boy Promotions to discuss his next fight and we are about 10 weeks away from December 15 and without as so much as a television deal in place for that next fight, it's possible there's no December 15 show after all and Alvarez fight as early as February 2019 or as late as Cinco De Mayo weekend next May. The closest scenario we have to Alvarez's free agency situation is that of LeBron James in the NBA when he left the Cleveland Cavaliers on two occasions and the Miami Heat once. He was the biggest star in basketball and every team wanted to get him as he alone was a game changer for the entire league, and the sport at large. It's similar in Alvarez's case as he is arguably the biggest boxing star in the world and certainly the biggest in the United States. He's only 28 years old, in the prime of his career and has the looks to be a centerpiece of any company out there. Right now, the favorite to land Alvarez for a long-term TV deal would be Showtime as the two sides already have history together. A deal with Showtime, unless it is an ironclad exclusivity deal, also creates an opening for Alvarez to fight on FOX, which in this day and age in the sport of boxing in the United States, it is unheard of. We saw something similar last year Manny Pacquiao fought on ESPN, but Pacquiao wasn't the star that he was in the early 2010s. Even so, that fight with Jeff Horn garnered incredible ratings for ESPN, which eventually became the catalyst for Top Rank's longterm deal with the sports network. Wherever Alvarez, as well as the rest of the free agents, ends with up, it will signify a massive shift in the power struggle between ESPN with Top Rank, DAZN with Matchroom Boxing and FOX plus Showtime with PBC. Such a change could potentially create the next boxing empire in the country, potentially one in the same vein as HBO's rule over the sport in the United States was for so many years.